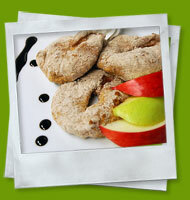 Apples are very popular ingredient in both sweet desserts and pastries. Excellent as a chicken with apples, vegetable and potato salads refreshed by diced chopped apples and many other delicacies. In this case, you will appreciate the diversity of the varieties, for the salt kitchen acidic and very juicy apples are the most suitable. Therefore, we have prepared a couple of traditional and innovative recipes in cooperation with the catering company MB food. 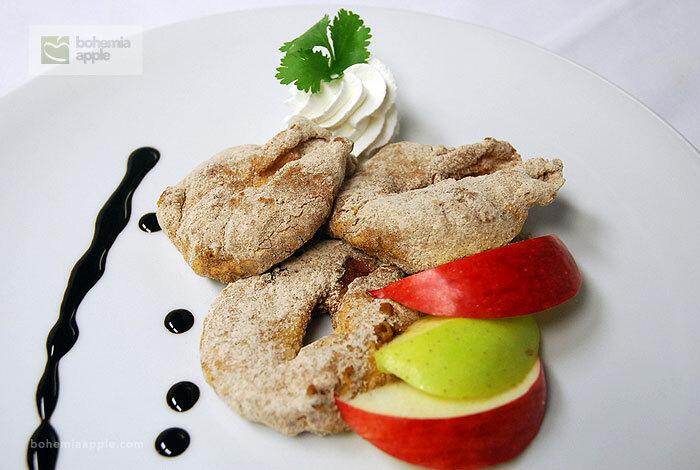 You can find more on www.mbfood.cz. We rinse raisins, put in wine and let it swell for about 15 minutes and then another 10 minutes simmer in wine. We peel apples, get rid of cores. 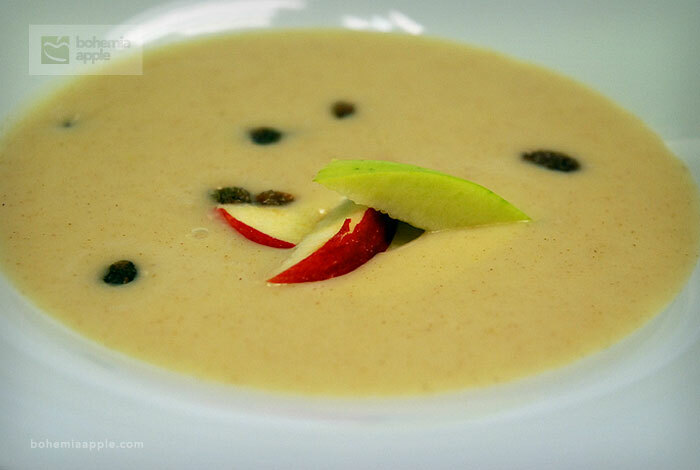 Put apples in a pot and pour water, add chopped french bread, little bit of cinnamon and simmer slowly. Then mix that mixtures, strain it and put in a freezer to cool down. 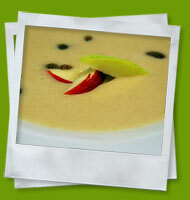 Before serving, put the raisins into the soup and garnish with pieces of fresh apple. We wash apples properly and dry and get rid of cores. We care not to disrupt apples. We cut apples into slices about half an inch thick. Put together flour, wine, eggs and salt to prepare thin dough, into which mix baking powder. Individual apple slices soak in it and immediately bake until gold in hot oil. It is possible to prepare as well in deep fryer. Fried rings let drain on paper towel. Then roll in powdered sugar and cinnamon. Serve on a plate. Garnish as fantasy with heated chocolate, whipped cream and a sprig of mint. We cut apples into quarters, getting rid of cores then we cut into slices about half an inch thick. We sprinkle sliced apples with lemon not to get brown. 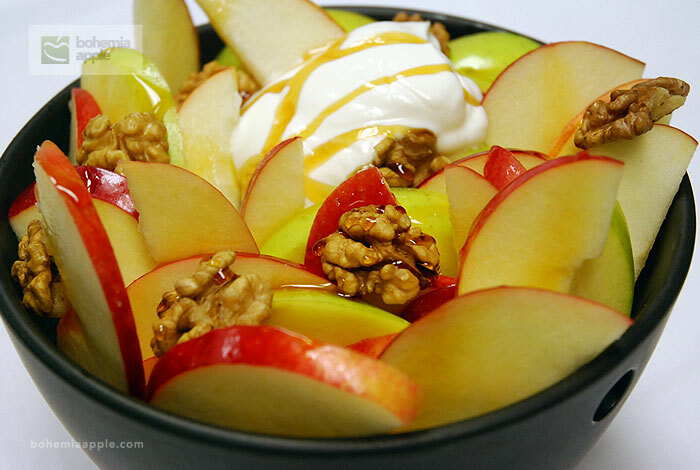 Arrange apple slices as fantasy in a bowl, sprinkle it with yoghurt, and sprinkle with nuts and maple syrup or honey. We dip a cut white bread into milk and put it in the pan. On top we put half of shredded apples, cinnamon, walnuts and raisins. 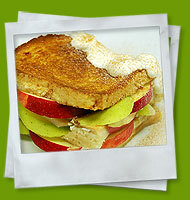 On top of apples we put half of white creamy cheese. 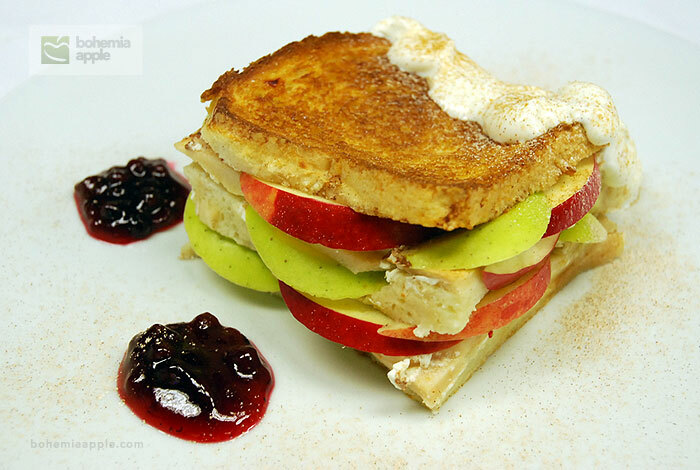 On top of that we put again bread dipped in milk, than again apples, cinnamon and white cheese. The top part consists of another layer of bread, again dipped in milk. We sprinkle it with half a tablespoon of sugar. It caramelizes during a baking process. We put the pan into a pre-heated oven (170 °C) and cover it with a lid, after 30 minutes we take the lid off and raise the temperature to 200 °C. We bake till the top part becomes dark. Once ready, we can serve “žemlovka” warm or cold. We cut “žemlovka” and serve on a plate. 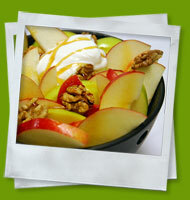 We can decorate with fresh apples, cinnamon sugar, yoghurt or sour cream and cranberry or currant marmalade.